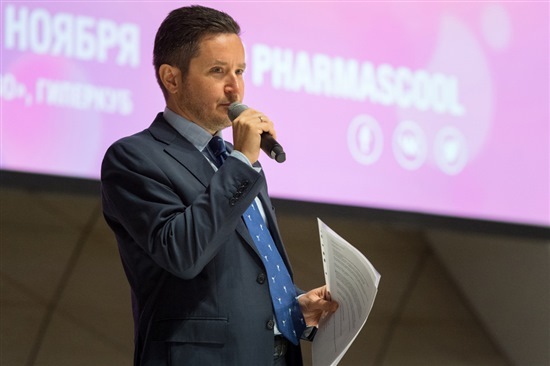 The fifth Pharma’s Cool educational programme for students and young entrepreneurs began on Monday at the Skolkovo Technopark. 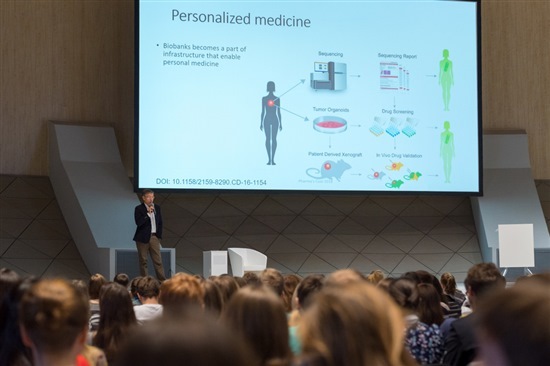 Organised by the Skolkovo Foundation’s biomed cluster and Open University Skolkovo (OPUS), Pharma’s Cool aims to teach students and startups about the practical aspects of drug development and getting a new drug to the market. This year, the programme has been divided into two parts: one on October 22-24, devoted to developing new medicines and the perspective of the pharma industry, and a second on November 12-13 devoted to business, such as mechanisms of working with venture investors, and guidelines for raising money. Pharma's Cool is aimed at giving students practical skills that they might not learn at university. Photo: Sk.ru. “I call on you to work hard during the next two days. There is an interesting prize for those who pass the test at the end: the chance to intern at companies working in the field of pharma development,” Kirill Kaem, senior vice president for innovations at the Skolkovo Foundation, told about 1,000 people attending the programme at its opening on Monday. Testing takes place at the end of each day of the event, and the highest scorers will win the opportunity to intern at Pharma’s Cool’s partner companies, which this year include AstraZeneca and Johnson & Johnson. “We will talk about the fundamental rules of drug development, the state of the biotech and cellular markets, and the specifics of carrying out clinical research into cancer and orphan drugs [drugs that have been developed to treat rare conditions],” Kamila Zarubina, acceleration director within Skolkovo’s biomed cluster, told Sk.ru ahead of the event. The first module also includes a role-playing exercise on developing drugs organised by a team headed by Dmitry Kulish, a professor at the Skolkovo Institute of Science and Technology (Skoltech) and head of the company DrugDevelopment. Skolkovo senior vice president for innovations Kirill Kaem welcoming Pharma's Cool participants. Photo: Sk.ru. “During the second module [which will be held inside Skolkovo’s Hypercube building], the topic will be the business component of working in this industry: how to create a company, where to find investment for your own biotech project, and how to protect intellectual property rights to the results of the research,” said Zarubina. The emphasis of Pharma’s Cool, which is free of charge to attend, is firmly on practical skills, and speakers – representatives of Skolkovo companies, pharma corporations, venture funds and leading universities – will not only talk about their success, but about reasons for failure too. “Cooperation with the Skolkovo Foundation within the framework of Pharma’s Cool is an excellent opportunity for us to pass on our knowledge and experience in the field of developing drugs and bringing them to the market,” Kira Blong, medical director for AstraZeneca, Russia and Eurasia, told Sk.ru. “We hope that our partnership will become a catalyst for the appearance of new innovative medicines for treating socially significant diseases, and that it will contribute to improving the quality of treatment and quality of life of Russian patients,” said Blong.